DACA May Soon End; Is Your Workforce Affected? The potential loss of nearly 800,000 workers following the termination of a program for young, undocumented immigrants is raising concerns in the business community. Termination of the deferred action for childhood arrivals program “presents one of the most interesting issues for business,” immigration attorney Andrew Greenfield of Fragomen, Del Rey, Bernsen & Loewy told Bloomberg BNA Sept. 6. That’s because employers “very well may not know who their DACA employees are,” he said. DACA recipients would have shown their employment authorization using their DACA work permits, but they’re not labeled DACA, said Greenfield, who manages his firm’s Washington office. Work permits “look pretty darn similar” but have different codes based on the source of the authorization, he said. Even businesses with solid employment verification practices aren’t necessarily going to know what each code means, he said. Greenfield said a lot of his clients are concerned about the business impact of the program’s termination. “There’s a potential loss of human capital,” and not knowing its extent is “concerning to many employers,” he said. But others see the end of the program as an opportunity for U.S. citizens to take over the jobs that DACA recipients will vacate when their work permits expire. “I think that it’s a known fact that there are over 4 million unemployed Americans in the same age group as those that are DACA recipients; that over 950,000 of those are African Americans in the same age group; over 870,000 unemployed Hispanics in the same age group,” White House Press Secretary Sarah Sanders said during a Sept. 5 press briefing. “Those are large groups of people that are unemployed that could possibly have those jobs,” she said. The president is focused on responsible immigration reform and wants to work with both sides to achieve it, a White House spokeswoman told Bloomberg BNA Sept. 7. A new report from pro-immigration group FWD.us and the left-leaning Center for American Progress found that 91 percent of DACA recipients are employed. It also estimated that an average of 30,000 DACA recipients will lose their jobs every month as their work permits expire. For each business day, some 1,400 DACA recipients will lose their jobs, the report said. The number of permit expirations is slated to be greatest between July and September 2018, with 152,429 losing their status, the report said. That translates to 50,810 lost workers per month and 12,098 lost workers per week during that three-month period. Those DACA recipients won’t be able to renew their work permits under the terms of the DACA phase-out. The removal of close to 700,000 workers from the economy would result in a $460.3 billion drop in the national gross domestic product over the next decade, according to a separate CAP report. California will be the hardest hit, with a loss of 193,832 workers and $11.6 billion from its GDP. Next is Texas, with a loss of 108,141 workers and $6.2 billion from its GDP. The $460 billion loss in national GDP is “about twice” the estimates of loss from Hurricane Harvey, Todd Schulte, president of FWD.us, told Bloomberg BNA Sept. 6. It’s an “astronomical economic disaster,” he said. “My top concern about the DACA work-permit amnesty has always been the addition of hundreds of thousands of illegal aliens competing in the legal labor market against struggling American workers and legal immigrants already here,” NumbersUSA President Roy Beck said in a Sept. 5 blog post. “This has created downward pressure on wages and meant that hundreds of thousands of Americans—particularly Millennials—do not have jobs at this time,” said Beck, whose organization advocates for less immigration. 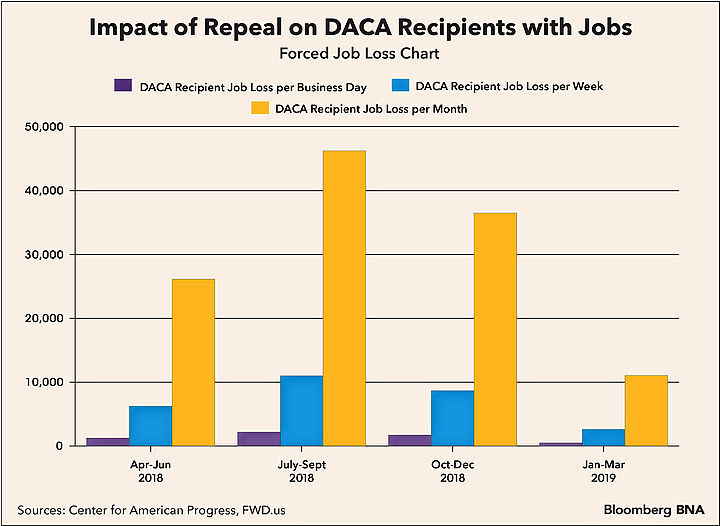 DACA recipients have always been in a “vulnerable position,” which makes them more attractive to employers than U.S. citizens, NumbersUSA Director of Research Eric Ruark told Bloomberg BNA Sept. 7. They have less bargaining power and “don’t want to upset the situation” in order to preserve their status, he said. There will be a “modest effect of opening up some jobs for Americans,” but it won’t be a “big effect,” Mark Krikorian, executive director of the Center for Immigration Studies, told Bloomberg BNA Sept. 7. DACA recipients are a small portion of the labor force and are spread out across the country, he said. Studies of DACA recipients show that about half were already working when they received their permits, and so many of them will keep working after the permits expire, said Krikorian, whose group supports lower immigration levels. They either won’t tell their employers, their employers will keep them on illegally, or they’ll set them up as independent contractors to avoid the ban on employment of undocumented immigrants, he said. And those who don’t keep their current jobs will likely seek employment in other jobs where employment verification is more loose, Krikorian said. “This administration hasn’t really engaged in any significant work-site enforcement in any way,” making it easier for DACA recipients to keep working illegally, he said. There’s also still a lot of uncertainty surrounding the ultimate fate of DACA and the immigrants it protects, Ruark said. He pointed to President Donald Trump’s Sept. 5 tweet that he would “revisit this issue” if Congress doesn’t do anything during DACA’s six-month phase-out period. The president followed up Sept. 7, tweeting that DACA recipients “have nothing to worry about” over the next six months. Under the phase-out plan, anyone whose work permit expires before March 5, 2018, can apply by Oct. 5, 2017 to renew. Current work permits remain in effect until they expire, but new DACA applications no longer are being accepted. “Everyone is really looking to the president to be clear and more distinct” about “how he wants this to be resolved,” Ruark said. Employers are also looking to see “whether they should be proactive” in identifying their DACA workers and seeing if they can help in any way, Greenfield said. The answer is yes. For one, employers may be able—but aren’t required—to help with the DACA renewal process if employees are among those who can renew their work permits between now and Oct. 5, he said. They may also be able to help figure out other avenues for their DACA employees to stay in the country, such as applying for political asylum or temporary protected status, he said. If a DACA recipient—or any employee—loses his or her work authorization, “the employer must act on that immediately,” Greenfield said. And employers can’t plead ignorance. The law makes employers liable for employing unauthorized workers if they know or should have known those workers weren’t authorized, Greenfield said. That means an employer is on the hook even if nobody actually knew the worker’s authorization expired, because good recordkeeping would’ve alerted the employer to that expiration, he said. Companies that feel strongly about the issue also should speak out publicly and contact their members of Congress, Schulte said. Right now “there’s a clock on 800,000" lives, and the U.S. can either “do the unthinkable” and deport them, or pass legislation that allows them to stay permanently.